Here are a couple of good pieces on antisemitic and racist conspiracy wanker Laurence ‘I’m not a fascist’ Easeman. Aside from being a general antisemite, racist, tin-foil hatter, proto-fascist and no mark he also runs a company which provides bailiff services and a tenant blacklist for landlords. Wow! Such a man of the people! Well done to the authors! And a message to Easeman’s lap-dogs and crying brigade, GET FUCKED! 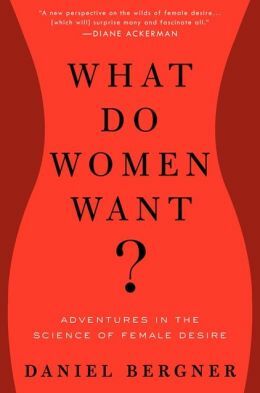 Daniel Bergner’in “What Do Women Want?” kitabıyla ilgili düşüncelerimi ve kadın arzusu hakkındaki bir noktayı şurada anlattım. Şimdi kitaptan öğrendiğim başka bir şeyi anlatmak istiyorum. Kadınlar ne ister: Dişi fareler hamile kalmak istemez mesela. Daniel Bergner’in “What Do Women Want? Adventures in the Science of Female Desire” (Kadınlar Ne İster? Kadın Arzuları Biliminde Maceralar) isimli kitabını okudum bir arkadaşımın önerisiyle. On 17 December four years ago a young unemployed Tunisian, Mohamed Bouazizi, trying to make a living as a street vendor, set himself alight. His immediate grievance was harassment from municipal inspectors but this came in the wake of a long period of frustration. He died on 4 January 2011, 18 days later, by which time Tunisia was convulsed by public protests against the elitism and autocratic rule of the regime of President Zine al-Abidine Ben Ali. They peaked on the weekend of 8-9 January and resulted in the collapse of the entire regime. Within weeks, protest against autocracy had spread across the region, culminating in the extraordinary developments centred on Tahrir Square in Cairo which resulted in the collapse of the Mubarak regime, long supported by the West and widely regarded as one of the most stable if harsh regimes in the entire region. Nearly four years later and in the midst of current turmoil, especially in Iraq and Syria, Tunisia is unique among the ‘awakened’ Arab states in having seen continuing political change leading to an evolving democracy. Yet it is also a state in which many young people are being radicalised into an extreme Islamist outlook and some are joining Islamic State as determined jihadists. Indeed, for the size of its population Tunisia is one of the Islamic State’s leading recruiting grounds. Why this is happening in a state in the region that has made considerable progress towards representative democracy is a key question. It is rarely asked but is of great importance if one seeks to understand the context in which Islamic State, with all its brutality, is attracting support. In the interim administration established after the fall of the Ben Ali regime, the well-organised if previously underground Ennahda Party, with its Muslim Brotherhood orientation, assumed power as the largest party in the October 2011 elections. Criticised for its failure to manage the economy as well as problems with security issues it lost this October’s elections to the newly established legislature and power was transferred to a more secularist coalition. This peaceful, polite transition was itself seen as considerable progress. The 23 November first round of the Presidential Election involved many parties and no one candidate emerged victorious. The run-off on 21 December, just four days after the anniversary of Bouazizi’s desperate act, will be between Beji Caid Essebi, the 87-year old leader of the secularist Nidaa Tounes Party, and Moncef Marzouki, a centrist candidate with a rights activism background. Essebi was narrowly ahead in the first round but is criticised by Marzouki because of his links with the old Ben Ali regime. Essebi, in turn, points to Marzouki’s links with the discredited Ennhada’s period of rule which ended in crisis at the start of the year and a short-term handing over to an interim technocratic administration. Whatever the result, analysts point to the basic issue which is that Tunisia really has undergone a transition and has the prospect of a stable elected government. But this also raises the issue of why so many people in the country, especially among the young, are intensely dissatisfied to the extent of looking to extreme Islamist groups. 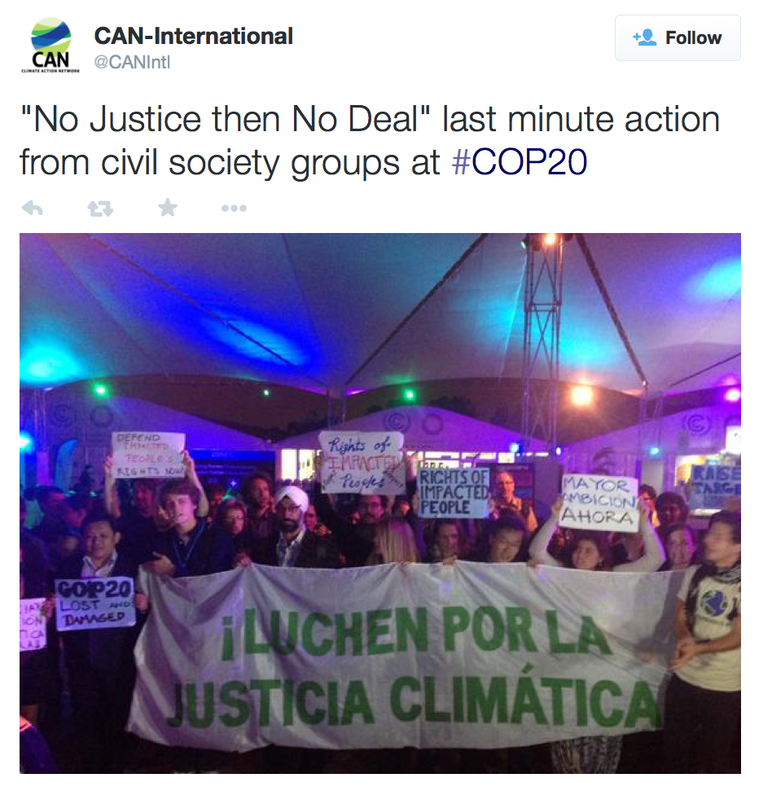 …which combines substantial economic marginalisation with a young and often frustrated population. Demographic trends across North Africa and the Middle East lag well behind the decreases in birth rates seen in the past three decades in many parts of the world. This means that there are large cohorts of young people between the ages of 15 and 25, for whom there are few employment opportunities. Their predicament is made worse by low economic growth rates leading to limited job creation, but because of welcome improvements in education provision, they are particularly aware of their own marginalisation. Such a circumstance transcends political parties and even religious beliefs, but may lead to radicalisation rooted in a political ideology or, more commonly, an austere religious outlook. What is of huge significance to the movement is the fate of the Arab Awakening. If the near-revolutionary changes now in progress in Tunisia and Egypt are successful, and are emulated elsewhere, then the al-Qaida movement faces its greatest challenge. However much the new leadership might extol the public opposition to regional autocracies, the reality is that al-Qaida has been pushed into near-irrelevance as multifaceted and frequently secular public protests have carried the day. If, though, the awakening falters and autocracies retain, or in some circumstances even regain, control, then al-Qaida and related jihadist entities may rapidly return to centre stage. In the event, some states such as Morocco engaged in a somewhat enhanced process of reform and others such as Saudi Arabia repressed dissent, at home and in Bahrain, while the Assad regime responded with considerable brutality. The Gaddafi regime in Libya was terminated with considerable military help from NATO states but the country has since declined into bitter internal conflict between multiple militias, many of the more powerful groups having Islamist orientations. Yemen has faltered between repression, state collapse and a complex proxy war. Al-Qaida as a coherent movement is close to being defunct, but allied groups in Yemen, Somalia and the Sahara are thriving, Boko Haram is rampant in northeast Nigeria, and Islamic State now controls substantial territory and several million people. The war on terror has recently entered its fourteenth year, the US withdrawal from Afghanistan has slowed, and the western troop involvement in Iraq has risen from a handful at the start of the year to 3,000, with a further 1,500 due to be deployed shortly. Air strikes and armed drone attacks are a daily occurrence and are likely to expand. While Islamic State is in competition with what remains of al-Qaida it is seen as the most dangerous of the current manifestations of Islamist extremism. It may currently be held back from expanding its territorial control by western air strikes but it is succeeding in maintaining a flow of recruits from across the region and beyond. Its development is hugely bound up with complexities including the Syrian civil war, the previous marginalisation of the Iraqi Sunni minority and the wider issue of the Shi’a-Sunni regional competition and Iranian-Saudi relationships, but the issue of recruits to the cause is also central to its possible progress. In seeking to understand why Tunisia is significant as a source of recruitment in spite of its internal political progress there appear to be two main factors aiding involved. One is that in the transition from the autocracy of the Ben Ali era, many political prisoners were released and they included radical clerics as well as others who had been radicalised in the direction of an Islamist outlook while in prison. Over the past three years they have successfully proselytised some young people, partly through mosques and partly through social interaction, including the new social media. 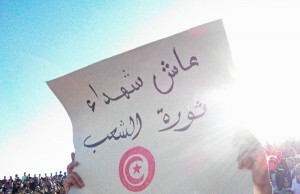 Even so, this does not explain why young people in Tunisia should be attracted to this outlook in the first place. The indications are that this stems substantially from a severe lack of life chances among many of them, especially recent graduates. Accurate figures for numbers are not easy to come by but there have been indications of as many as 140,000 unemployed graduates in a population of 11 million. Some more reliable data shows that unemployment among recent graduates rose from 14% in 2005 to 30% last year. For 2013, this 30% figure compared with an overall national unemployment rate of 17%. Part of the reason for this is the international economy’s recent downturn, but in Tunisia’s case there has also been a serious decline in the tourism sector as well as economic mismanagement by the previous Ennhada-led government, both of these having a particular effect on recent graduates and their employment prospects. There has thus developed a particularly high level of frustration which is exacerbated by the earlier expectation after the end of the Ben Ali regime that prospects for ordinary Tunisians would improve. As the new government takes office in the New Year it will face a political environment in which there is a loss of support for governance of any form, given that the transition from autocracy to democracy has not resulted in better economic prospects. The government may well turn out to be effective but that does not diminish the extent of the task, especially at a time of regional economic problems let alone the turmoil across the border in Libya. What has already been happening in Tunisia is now developing in Egypt and this has much greater potential for a regional impact. The transition to democracy after Tahrir Square resulted in an incompetent and non-inclusive Muslim Brotherhood government that was replaced last year by what is essentially a return to the Mubarak era under President al-Sisi, even if initially popular. The new government has been markedly repressive against the Brotherhood and its supporters with well over a thousand killed and tens of thousands detained. That is fuelling the rise of extreme Islamist elements within Egypt, especially but not only in Sinai, but there are also indications that recruitment from Egypt into the Islamic State cause is increasing, with this including people with an originally secularist outlook who are embracing an Islamist vision as the only alternative to what is seen as a repressive and autocratic system. It is stemming partly from the al-Sisi policy of repression of opposition but is made worse by a more general frustration and anger at the economic as well as political marginalisation of so much of the population. The ORG analysis quoted above (June 2011) of the consequences of the Arab Awakening faltering does now seem uncomfortably prescient, but not quite in the way expected. It is not al-Qaida that is to the fore, but another movement, Islamic State, which was just forming from al-Qaida in Iraq in mid-2011. More significantly, though, economic marginalisation, even in countries transitioning to more democratic governance, may prove to be a seriously underestimated factor in the recent and future development of Islamic State. This has major implications for how the problem of this movement’s growth and brutality is approached. If it is seen simply as a security threat for which the response is essentially military then that is missing an important part of the problem. Unless some of the more deep-seated elements of the region’s economic environment and the manner in which they aid Islamic State are also recognised, then responding primarily with force may be little more than treating symptoms rather than underlying causes. Furthermore, this is an issue which is likely to be exacerbated if the recent substantial downturn in oil prices turns out to be a long-term trend, given the implications for the wider economy of the Middle East. Author: Paul Rogers is Global Security Consultant to Oxford Research Group and Professor of Peace Studies at the University of Bradford. His Monthly Global Security Briefings are available from our website at <www.oxfordresearchgroup.org.uk> where visitors can sign up to receive them. This is going viral on social media, we have no connection with the author but thought it was worth sharing. I have dined in your establishments many times but I write to inform you that I will never do so again and nor will any of my friends or family. The reason for this is that my stepson has the misfortune to work in your Thomas Sheraton bar in Stockton and I am now aware of the basis upon which you operate and profit. He is “employed” on a zero hours basis and earns barely enough to feed himself. Not long after joining your establishment he got into trouble with his rent due to the extremely low wages and was evicted from his home. I blame the basis of his employment with you for this. He now lives 2 miles away from your bar and is obliged to walk this distance to and from work as he does not earn enough to afford public transport. Yesterday my wife was obliged to buy him new shoes as he had worn holes in his existing ones. I think it is appalling that you do not provide your kitchen staff with appropriate footwear. If you feel that this communication is becoming a stream of negative comments then I urge you to read on as I have more to say. This 4 mile round trip trudge is sometimes made to attend a one hour shift. Unbelievable, a day’s work of just ONE HOUR. Furthermore, if he attends expecting a longer shift this is sometimes not the case as he is sent home if trade is slack. He, your employee takes all the risk, you the employer take none. You’ll note that I do not mention his name. This is for fear of reprisals. Before you scoff, let me tell you this: When he first joined you, after two months of working every single weekend he politely enquired if he might have a weekend off. He was given the weekend off but worked no other hours either. A genuine ZERO hours. This was clearly a reprisal and he has never asked for the weekend off again. The only way he can survive on such grindingly low wages is by getting benefits top ups. In order to do this he must provide pay slips which you do not provide. He is obliged to download them and print them himself and given that he will never be able to afford a computer and printer so long as he works for you, he must go to the library. I put it to you that it takes him more effort to work for you for a pittance than it does me to fulfill a full time job. Clearly your business model requires that the public purse subsidise your employee’s wages. This to my mind makes your firm and others like you one of the benefit scroungers we hear so much about these days. 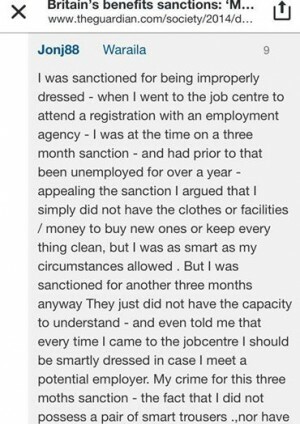 This is why those who carry out the sanctioning (Job Centre staff) and the group which defends them (The PCS) are scum and deserve no sympathy because they have no sympathy for anyone except themselves. I for one will never join Jobcentre staff or the PCS (Also represents the uniformed racists of the UK Border Agency or whatever it is calling itself these days) on a picket line…EVER, I would rather retire from politics altogether! 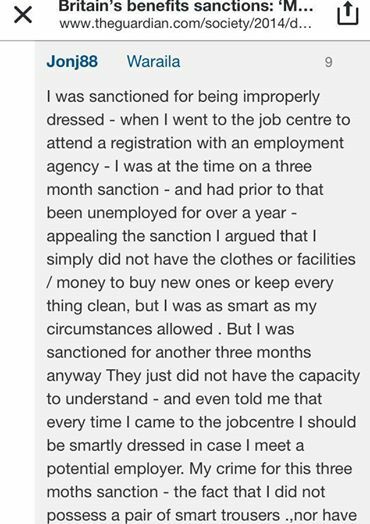 Unfortunately this sanctioning is not an isolated case but one of an endless number that has came before and will come after it unless we stop it! The self-activity of the working-class and our communities is an answer. They have declared a class war so we should give them one! 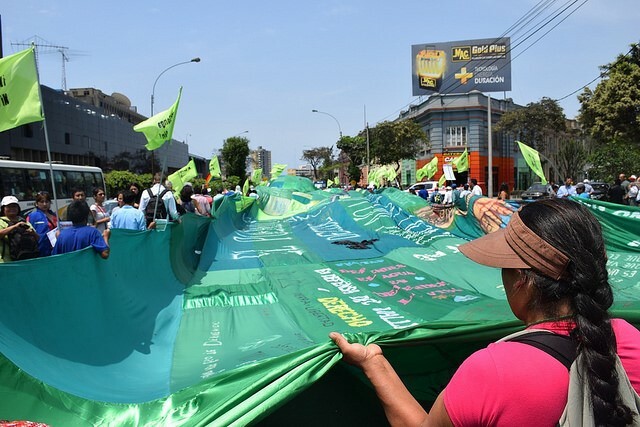 Yoğun iki gün uzatma sonunda iklim görüşmelerinin son turu Lima, Peru’da sonuca bağlandı. Görüşmeler, “İklim Eylemi için Lima Çağrısı” (Lima Call for Climate Action) adında, gelecek yıl Paris’te karar verilecek yeni iklim anlaşması için müzakerelerin çerçevesini oluşturan yeni bir metin ortaya çıkardı. Ancak genel olarak baktığımızda görüşmeler bir hayal kırıklığından ibaretti. Politikacılar Halkların İklim Yürüyüşü gibi etkinliklere rağmen iklim hareketinin yarattığı ivmeyi kullanmayı başaramadı ve pek çok büyük tartışmayı yolun dışına ittiler. Eğer Paris’te başarılı bir çıktı elde etmek istiyorsak – emisyon azaltımı ve iklim krizi ile mücadelede uluslararası çözümler inşa edecek bir sıçrama taşı olabilecek bir anlaşma- o zaman müzakereciler ve hareketimiz her şeyi bir adım yukarı taşımalı. 1. Yeni anlaşma iklim krizinin aciliyetini yansıtmıyor. Filipinli aktivist (ve 350.org yönetim kurulu üyesi) Lidy Nacpil müzakerelerin “temel kusurlarından” birinin “küresel ısınmayı sınırlandıracak bilimsel bir temele dayalı kesin bir küresel amacın yokluğu” olduğunu söyledi. Son IPCC raporunda bilim insanları, eğer sıcaklık artışını 2 derecede sabitlemek ve küresel felaketi önlemek istiyorsak fosil yakıtlardan kurtulmamız ve acil önlemler almamız gerektiğini açıkça belirttiler. Fakat açıkçası bu anlaşma bizi o noktaya ulaştırmayacak. –Tasneem Essop, WWF uluslararası iklim stratejisti. Ayrıca bu Çağrı dünya topluluklarının karşı karşıya olduğu aciliyete de işaret etmiyor. Görüşmelerde Tuvalu Başbakanı Enele Sopoaga, “İnsanlık tarihinde hiçbir ulusal lider şu soru ile yüz yüze gelmedi: ‘Hayatta mı kalacağız yoksa denizin altında yok olup gidecek miyiz?’” dedi. Lima’da oluşturulan metinde yer alan senaryolardan biri, 100’den fazla ülke tarafından desteklenen, yüzyılın ortasında karbon emisyonlarını aşamalı olarak durdurma hedefi. Lima’da ortaya konan bu gerçek oldukça büyük. Bu senaryoyu başarmanın tek yolu fosil yakıtlardan vazgeçmek, yani bu senaryo UNFCCC sürecini doğrudan fosil yakıt endüstrisinin karşısına düşürüyor. Lima Uzlaşması diğer müzakerelerden farklıydı, çünkü ilk kez bütün ülkeler karbon emisyonlarının durdurulması konusunda anlaşmaya vardılar. Her ülke gelecek aylarda bunu nasıl yapacağını rapor edecek. Ancak metinde, ciddi sonuçları olacak (ya da hiç sonuç çıkmamasına neden olacak) bir anahtar kelime değişimi var. Uluslararası karbon emisyonları azaltım planlarının yönetimi konusunda metinde bulunan “shall” [İngilizce’de zorunluluk bildiren bir yardımcı fiil] “may” [İngilizce’de istek, niyet bildiren bir yardımcı fiil] ile değiştirildi. Ülkeler yaptıkları planları raporlamadan sorumlu tutulmayacaklar – bu, her ülke “kritik Paris toplantısı öncesinde kendi ev ödevini kendi notlandıracak” gibi bir anlama geliyor. Hükümetlerin mantıklı önlemler almasını garantileme konusu bu yıl pek çok küresel baskı gerektirecek. Anlaşma ayrıca iklim değişiminden en çok etkilenen ülkeleri desteklemek için zengin ülkelerin kaçırdığı büyük bir fırsat. Şimdi küresel emisyonlar üzerinde en az etkisi olan ülkeler değişimi yaratmak için en fazla çabayı harcayacak olanlar olacak – ve yeterli desteği alamayacaklar. Kısacası bu iklim adaleti için iyi bir yergi olabilir. Görüşmelerde en çok konuşulan konu fosil yakıtlardan eninde sonunda kurtulmanın gerekliliğiydi. Leonardo DiCaprio’dan küresel bir Katolik piskopos grubuna kadar herkes küresel enerji değişimi ihtiyacından bahsediyordu. Ancak fosil yakıt şirketleriyatırım çekme (divestment) hareketini “bazı gergin eylemler” deyip geçiştirmek istese de görüşmelerdeki “kimi gergin hareketleri, açık ettiklerinden daha endişeli” olduklarını gösteriyor. Yüzyılın ortasına kadar 100 kadar ülkenin karbon salımlarının kademeli olarak durdurulması hedefini desteklediğini gördüğümüze memnun olduk. Hedefin taslak metin içinde yer alması fosil yakıttan yatırım çekme hareketi için bir kazanım ve ayrıca büyüyen kampanyaya da bir ivme kazandıracak. Ancak şimdi harekete geçilmeli, on yıllar süren bir gecikme ile değil. Bu da şirketlerin neden hemen şimdi bundan vazgeçirmek gerektiğinin nedenidir. Finansal, etik, politik olarak dünya böyle-gelmiş-böyle-gider mantığıyla devam edilemeyeceği gerçeğine uyanıyor. Bu daha iyi bir gelecek. Eğer iklim görüşmeleri yolunda giderse: “ExxonMobil & Shell 35 yıl içinde yok olacak”. 5. Gerçek çözümler için küresel ivme her zamankinden daha güçlü ve artmaya devam edecek. Geçtiğimiz iki haftada insanlığın büyük anlarına tanık olduk, gerçek iklim çözümleri için küresel hareket her zamankinden daha güçlü. Geçtiğimiz yıl boyunca yüz binlerce insan iklim için harekete geçilmesi talebiyle sokaklara akın etti, önümüzdeki yıl bu insanlara milyonlar eklenecek. Politikacılar ya bu dalgadan yararlanacak ya da bu dalgayla yok olacak. Harekete geçilmesi için önderlik etmek hepimizin elinde. 10 Aralık’ta Eylül’de başlayan Halkların İklim Yürüyüşü’nden gelen güzel ve büyük enerjiyi on binlerce insan Lima sokaklarına taşıdı ve gücüne güç kattı. Aktivistler, sanatçılar, yerli topluluklar oradaydı – iklim adaleti ve gerçek çözümler için taleplerini haykırdılar. Latin Amerika’daki iklim hareketi oldukça hararetli ve küresel iklim hareketinin onlardan öğrenebileceği çok şey var. Buradan yürüyüşün havadan görüntülerine erişebilirsiniz- yürüyüş çok büyüktü! Sonuç olarak, küresel iklim anlaşması iklim değişimi ile mücadele etmek için sadece bir araç. Gerçek değişim tabandan devam edecek. BM İklim Görüşmeleri iklim krizini tartışmak için dünya ülkelerinin bir araya geleceği bir yer olmaya devam edecek ve insanlar Paris’in Kopenhag gibi olmaması için büyük çabalar sarf ediyor. 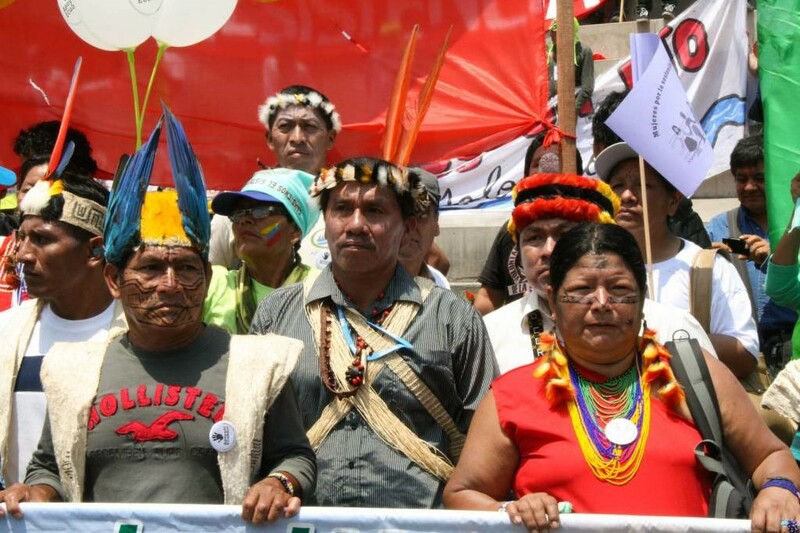 We will fight against exploitation in Amazon! from ZSP union. 10.5 hour shifts, one 30 minute unpaid break for lunch. Barely enough time to get to the canteen, eat something quick and get back to work. Not to mention that the food isn’t fresh. Half the time we work in the night, from 18:30-5 AM. Many of us travel more than one hour to work. Our bodies cannot adjust to the changing shifts. We miss spending the evenings with our families. We treat this job as something we are stuck with until something better comes along. Almost any job is better. Work in the fulfillment center is stressful, we are always monitored. There is a lot of physical work. We are exhausted in the first few hours. We cannot take a break to rest our feet. When we get home, we can only collapse. For all our hard work in the evenings and even on Sunday, we get no extra pay. Workers in Sady get paid more than workers in Bielany Wroclawskie for the same job. In some countries, workers get more money for the evening shift and two paid 15-minute breaks. Not in Poland. A lot of colleagues say the same: they thought they would have opportunities to work more, overtime, extra pay for night shifts. They feel misled by the agencies that recruited them. Nobody told anybody what the work would really look like. Some people might not have taken the job. A lot of us have no other choice. There is a total mess with the payments. One colleague is not in the system and can’t get paid. Others claim they received too little payment. There are delays. People do not understand why their salaries are so low. Some of our colleagues already quit and a lot where just hired til the end of the year. Some of us will stay on here, hoping that things will get better. But nothing will change if we let the bosses treat us like slaves. In Germany workers make 4 times more money for the same job and they still fight for better working conditions. We are being used to increase the profits of a company that earns enough to pay their workers decent wages. ZSP union has taken action concerning payments through Manpower and Adecco. We will fight so that agency workers and better informed and paid correctly and on time! 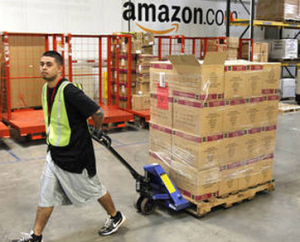 In the long term, we want to see better working conditions in Amazon Poland and this means concretely a higher rate for evening and Sunday work, no pay discrimination and paid breaks. Fair play for Mike Haney! Communications blockade of Gwalia housing association. Mike Haney has worked for Gwalia, a large housing association for 8 years, in July 2013 they changed his workplace without any consultation, increasing his annual mileage to and from work by 3,525 miles. In addition to fuel and vehicle maintenance costs he incurred extra insurance premiums. Gwalia have since cut Mike’s salary by £300 per month, making it financially impossible for him to continue. Mike has volunteered for redundancy but is being refused. Mike has resorted to camping outside his work place at Brecon House, Llantarnam Industrial Park Cwmbran. Np44 3AB. Phone: 01633 833540 He’s camping out 22nd 23rd 29th & 30th Dec, then from 5th Jan he’s there from Monday-Thursday for as long as it takes! Please support Mike Haney by contacting Gwalia Hierarchy telling them to give him redundancy he deserves otherwise the fight goes on! He’s on his own but with plenty of fighting spirit. or phone 01792 488288 and ask to speak to one of above. If you would like to go and support Mike in person get in touch first (as he might be working). We will will pass on any messages of support and solidarity to him. I have worked for Gwalia for 8 years. Two years ago I took out a mortgage. I could afford this based on my salary at that time. I could not have anticipated a cut in salary as Gwalia had stated in their 2012 corporate report that they had increased surplus and that their finances were robust. Indeed they had factored in yearly wage rises. In July 2013 they changed my workplace without any consultation. This increased my annual mileage to and from work by 3525 miles. It also put me over my insurance mileage limit and so incurred me further costs. Increasing cost of living was also taking its toll, but by cutting back on every possible expense I was continuing to keep a roof over my head. Gwalia have now cut my salary by £300 per month. There is no living expense I can cut now, except my home to work mileage. I now have no alternative but to pitch a tent outside the office premises during the working week. Gwalia directors have shown complete contempt for my situation. I volunteered for redundancy but was refused. I believe that this was a deliberate effort by Gwalia to force me to leave the company with no recompense for the years of service and contribution to the company’s reputation that I have given. The constant changes within my terms and conditions and pay means that I am being forced to leave my job. However, if I resign and cannot obtain immediate employment, then I am unable to either claim any benefits or claim on my mortgage protection. Hence my current situation. Ironically I was a key member of a group who raised money for rough sleeper kits, including sleeping rough on one of the coldest nights of 2014. Gwalia were happy to make the most of the publicity this generated. 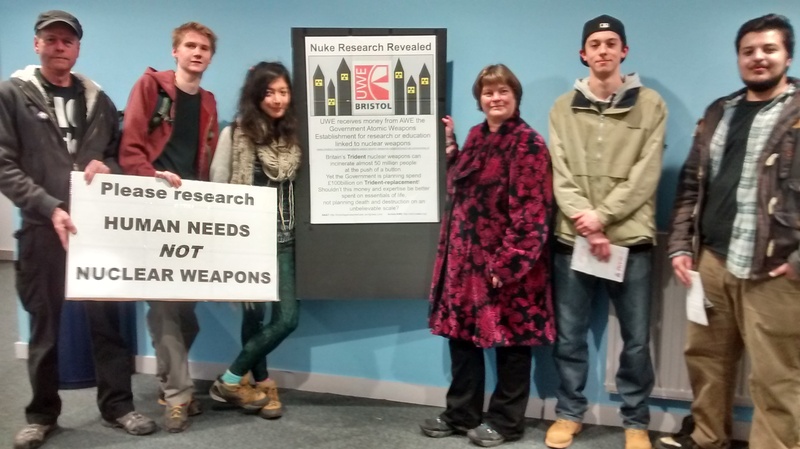 Full report on Bristol Against the Arms Trade’s blog here.